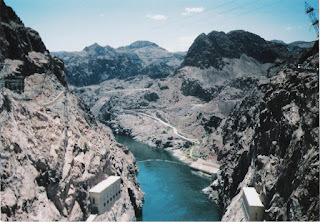 This is a picture I took in the summer of 2004 of the Hoover Dam in the Las Vegas area of Nevada. A good portion of the west gets some form of electrical power from the Hoover Dam. At one section of the dam, the time zone moves from mountain to pacific so it is very neat to repeatedly jump across time zones. Most of the power generated from the dam goes to southern California while the rest is split between other western states.